Sieves are usually made from bronze or stainless steel wires. They are available in varying degrees of fineness and sizes are quoted according to the size of the opening or in wires per inch. Sieves used by potters usually have plastic or wooden frames whereas those used in labs are made from stainless steel or brass. 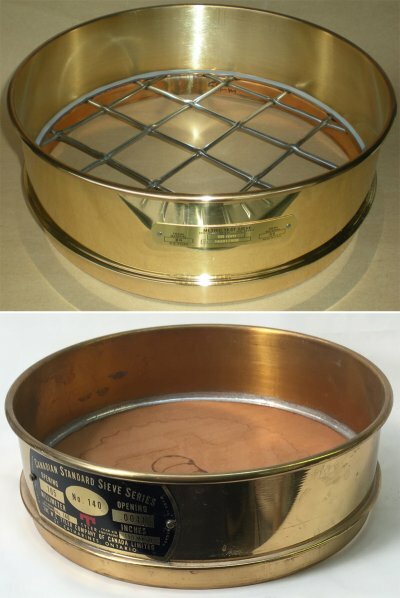 Common sieves are available to 325 mesh (wires per inch). Wires become too fine to see somewhere beyond 100 mesh. A 40-60 mesh sieve is normally used to screen earthenware and stoneware glazes and engobes (80-200 mesh for porcelain) to make sure they have no coarse particles or agglomerates that could mar the fired surface. Screens are also used in the production of raw materials and prepared bodies, glazes and engobes. They often have rectangular openings that follow material flow. Powders can be screened using vibrating equipment, but this is not normally practical beyond 80 mesh. Slurries pass through sieves better when they have a higher water content and are not gelled. How small can clay crystals be? 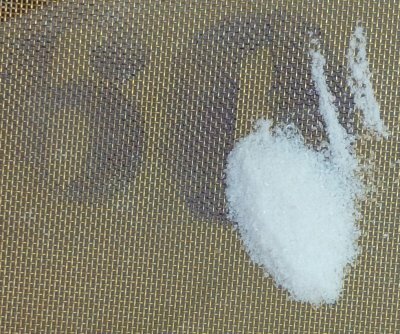 Table salt crystals on a 60 mesh screen. It has an opening of 250 micro meters (these are the half of the crystals that passed this size). Notice on the right, several crystals are in the openings, about to fall through. Imagine that bentonite or ball clay crystals can be 0.1 um in diameter, that is 2500 times smaller on a side. That would be 2500x2500 on a layer the size of a salt crystal and the thickness of a clay crystal. Since the clay crystal is much thinner than wide, perhaps ten could stack to the same dimension. That means theoretically 2500x2500x25000 could pack into a grain of salt! Potters often store glazes for long periods so tiny spherical precipitate particles can form. These were found in a months-old bucket of G2926B (M370 clear) cone 6 clear glaze (about 2 gallons). These can appear over time, depending on factors like temperature, electrolytes in your water or solubility in the materials (likely, the frit is slightly soluble). The glaze slurry should be screened periodically (or immediately if you note the particles when glazing a piece). This is an 80 mesh screen. Note the brush, using one of these gets the glaze through the screen much quicker than using a rubber spatula. 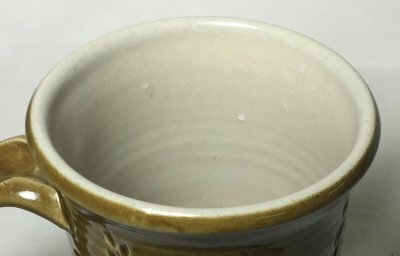 Do you need to rescreen a glaze slurry. Using a brush like this you will be able to get it through the screen much faster. This is because the rubber edge forces particles into the screen openings, plugging them. The brush is gentler, the oversize material just rolls around on top. 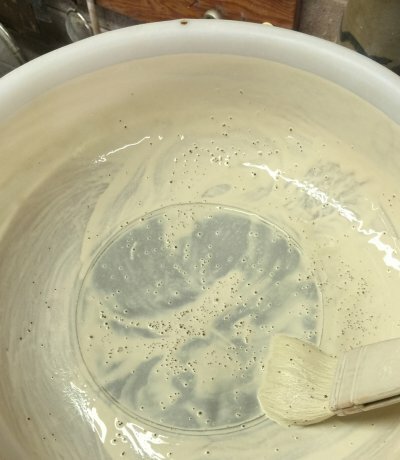 If you are screening a glaze for the first time, however, the spatula is better if there are agglomerated particles that need to be broken up (e.g. wollastonite, cornwall stone). When rescreening, any oversize particles (e.g. precipitates) should be discarded. The coarsest screen is at the top, the finest on the bottom. The opening for each is shown on the label. They are chosen such that each successive screen going down has an opening that is about half the area of the one above it. Using this series you can produce a practical measurement of the distribution of particle sizes in ceramic materials and bodies used in traditional ceramics (structural products industries, like brick, measure coarser particles than this, starting at perhaps 10 mesh and ending at 70). The 325 screen on the bottom is only used sometimes, it is difficult to finer-that-325 particles to pass through it because it blinds. It is not possible to shake powder through sieves that are this fine, samples must be washed through. We use the SIEV test to log results. To measure particle size in a slurry or powder you need sieves. This is the most popular type used in labs. They are made from brass by a company named Tyler. The range screen sizes for testing particle size is very wide. The top screen has an opening of 56 mm (that size and smaller pieces can fall through). The bottom sieve has an opening of 0.1 mm, the wires are almost too small to see. 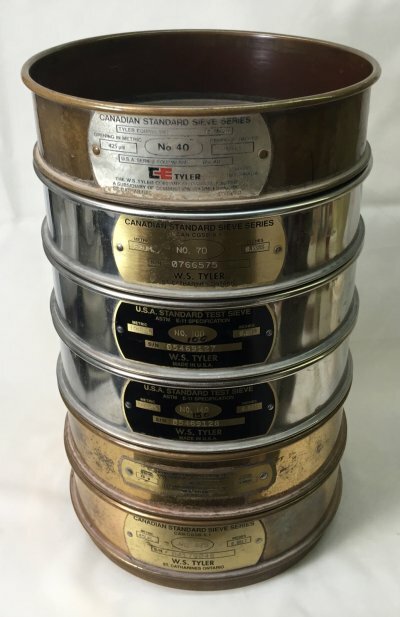 Coarser and finer sieves are available. You can buy these on ebay for a lot less than new ones, just search for tyler sieves. Keep in mind that the finer sieves (especially 325) are fragile and easily ripped. We use a series that bottoms out at 200. 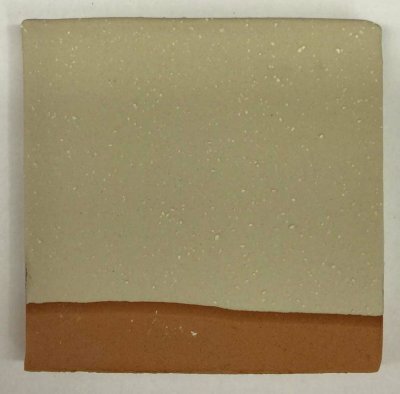 This glaze has just been applied to a bisqued tile. It contains wollastonite, which can agglomerate in storage. The white wollastonite lumps can be broken down by sieving the slurry through 80 mesh or finer. Many other materials behave in a similar manner (e.g. barium carbonate, iron oxide, cobalt oxide, clays, tin oxide, zircon). This is a cone 6 transparent base glaze. It contains frit, silica, kaolin, wollastonite. 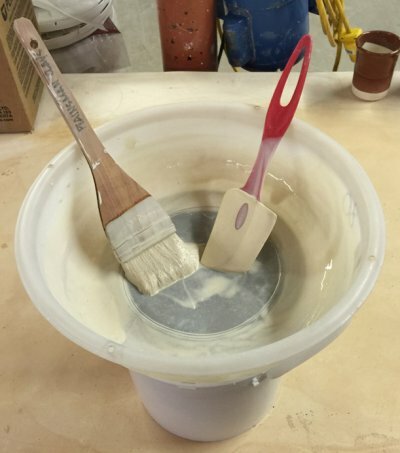 Almost all glazes have materials that are slightly soluble and over time these can form scale on the sides of the bucket or even precipitate particles into the slurry. The defects here are those scales. Before dipping a production piece in any glaze that has been in storage it is a good idea to assess it first to see if it needs to be sieved.